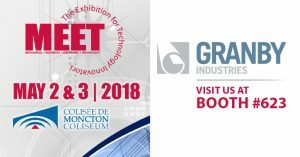 Granby Industries will be at the MEET (Mechanical Electrical Electronic Technology) show, the second largest industry event of its type in Canada and the largest trade event East of Montreal. Granby Industries, manufacturer of storage tanks for petroleum products and related heating appliances, will display its wide range of products at the at Moncton Coliseum and our Sales Team will be there to answer any questions you may have. Visit us at booth #623 on May 2 & 3 to learn more!